You're the type of girl who always puts a lot of effort into everything you do especially when coordinating outfits. Life is too short to look frumpy, a personal motto you faithfully abide by, so you do the opposite by consistently looking fancy and it gets noticed. Known for putting matching outfits together, you're always looking for little accessories to elevate your ensemble which is why these fancy cat tights need to be neatly folded inside your drawer ASAP. Supremely fancy, these Leg Avenue tights feature the two colors that go with everything: black and white. They're a great way to jazz up any little black dress but a fashionista like you already knows that. The tights are made from a blend of nylon, polyester, and spandex so they're very stretchy and able to fit all shapes and sizes which is why they conveniently come in one standard size. The hosiery features a sheer top which flaunts a hint of flesh while the bottom has alternating black and white stripes. A cute image of a kitty peeking out at the top adds an adorable touch that animal lovers will instantly fall in love with. Me-ow! 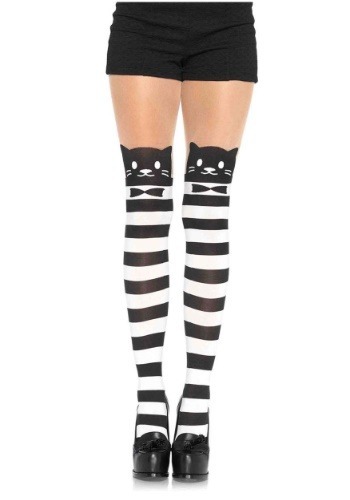 Not only will these tights spice up a little black dress but they accentuate any mime or Dr. Seuss themed costume.